Elissa Galveston Tall Ship at Texas Seaport Museum, Galveston. Elissa Galveston Tall ship was built in 1877 as a merchant vessel by Alexander Hall & Company in Aberdeen, Scotland.She started sailing the world dealing in small cargoes. It made its first call at the port of Galveston in 1883 On December 26, with one passenger and a cargo of bananas for sale. Elissa revisited Galveston in 1886. It was sold in 1897 by the owner, Henry Fowler Watt of Liverpool, to a Bugge & Olsen of Norway. Since then it passed through many hands and name changes until it was bought by GALVESTON HISTORICAL FOUNDATIONand renamed Elissa. It was then restored in Greece and sailed to Galveston. 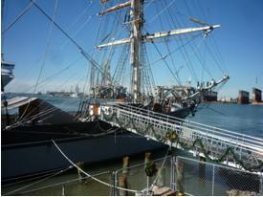 It is now stationed at the Texas Seaport Museum located in the historic port of Galveston. The ship made her first sail in Galveston harbor in 1982 then sailed on to Corpus Christi and New York forStatue of Liberty celebration in 1986. Elissa sails every year to remind us of the late 19th century means of sailing and exploration. 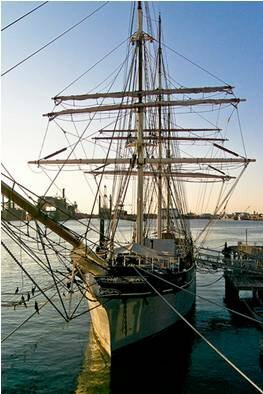 The Texas Seaport Museum also tells the story of a rich legacy of seaborne commerce and immigration. Over 133,000 immigrants entered the United States through Galveston. It also shows a 15 minute movie on the 1900 hurricane and the efforts made to rebuild the island. Make sure to visit the gift shop. It has some valuable informative gifts.